LTM Group are dedicated to producing the highest quality workmanship using traditional materials and methods. At LTM Group our people are our greatest asset and make the company what it is. LTM Group is ideally suited to individuals who enjoy working in a challenging and exciting environment and we look for enthusiastic individuals to contribute to the success and development of the company. We look for individuals who are highly motivated, good team players and a flexible approach to the working environment. Construction background and a driving licence would be preferred. Ideally site staff should be in possession of a valid CSCS card. In return, site staff will have the opportunity to work on various prestigious building throughout Scotland and beyond. Good rates of pay and benefits package offered to the right candidates. 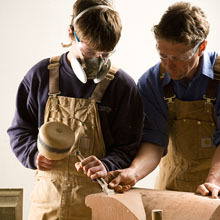 If you are keen to learn, have the ability to understand clear instructions and have good communication skills to interact with people then the BCT (Building Conservation Technician) Modern Apprenticeship path may be of interest to you.